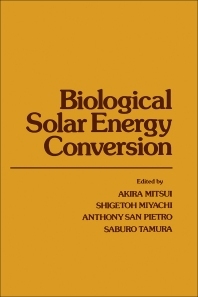 Biological Solar Energy Conversion is a publication comprised of formal papers presented during the 1976 conference on Biological Solar Energy Conversion held at the Rosenstiel School of Marine and Atmospheric Science. The conference aims to bring together a group of scientists who have made significant observations concerned with various aspects of solar energy conversion. The ideas and information presented in this publication intend to expand the understanding of the readers about the biological processes involved in biological solar energy conversion and direct them to practical application. This compilation is divided into four sections and consists of 25 scholarly articles about the subject matter. The first section includes papers that discuss developments in the methods employed in the capture and utilization of solar energy. The second and third sections feature papers that dealt with the synthesis of organic compounds from carbon dioxide and nitrogen fixation and production of single cell protein. The last section of the publication presents papers that show future trends and practical applications involved in the biological conversion of solar energy. This book will be an excellent reference for researchers working on energy research and development. This collection of scientific articles can also be an invaluable reference for agriculture, meteorology, plant sciences, agronomy, and biology students.